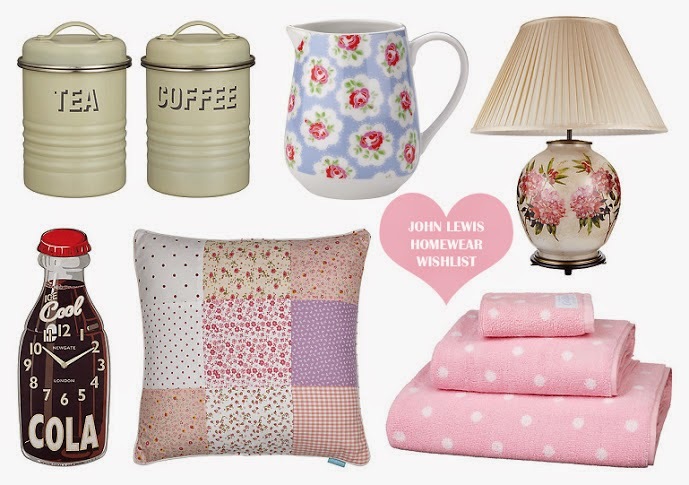 Floral Danielle: John Lewis homeware wishlist! I have always loved browsing the homeware at John Lewis, even as a kid, and nowadays when I pop in with Joe, we always seem to find 100 things that we say "oh we can add this to our house when we move in together", so I thought I would start doing homeware wishlists more often, as I love reading them myself, and I love getting excited about moving into my own little house! It's actaully sad how excited I am for little things such as buying tea, coffee and sugar storage for my kitchen! I love the simplicity of this set, and would really like to have simple pastel colours in my kitchen with some vintage advert signs hanging on the walls. I cannot go into John Lewis without having a little browse of the Cath Kidston range! With the mugs at only £6.50 each, and some of the other kitchen supplies at just £7/8 each, I am slowly but surely starting to build up a lovely little collection! I absolutely love the pattern and colours of this pouring jug, and would have to get the mug in the same pattern to match! As you all know (and judging by my blog name) I love all things floral! I particularly love this lamp with the floral pattern on the bottom half, although I would probably change the lampshade into a pink tasseled vintage one to go with all my other vintage finds! John Lewis have so many gorgeous table lamps for all around the house, and I know that I'm going to end up with a house full of pretty little lamps! I absolutely love this clock! I love finding genuine vintage items for my future house, but I also love finding brand new items with a vintage feel. This has such an American Diner feel and would be so lovely in the kitchen! How cute is this patchwork pillow?! I love the ditsy patchwork materials mixed with some gingham and dotted patterns too! I love all the different pink and purple shades and think this would look so lovely in a white and pink bedroom! Which bits do you like best from my wishlist? Do you have a homeware wishlist post on your blog too? That Coca Cola wall clock is class, love it! Love al of your picks! I could wonder around the homeware section for hours, they always have such stunning pieces. You have such wonderful taste! I want everything! I think the tea and coffee tins are absolutely adorable!